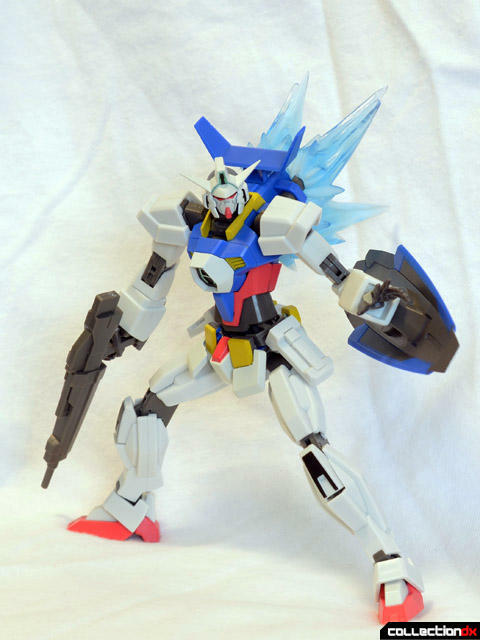 Robot Spirits Gundam AGE-1 Normal comes courtesy of Angolz.com! 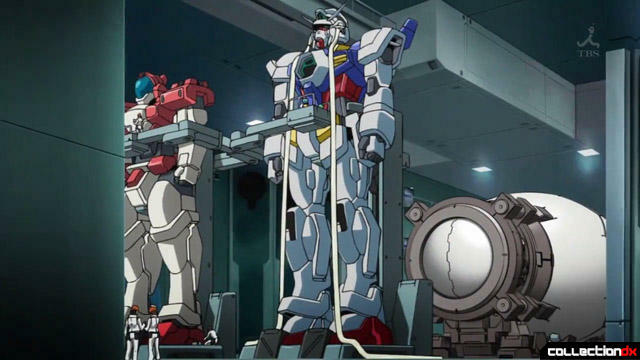 Mobile Suit Gundam AGE is the currently running iteration of the long-standing Gundam franchise, and it is awesome. AGE takes place in its own continuity, and is aimed towards a younger audience, but still manages to be really well-written and a ton of fun even for older viewers. 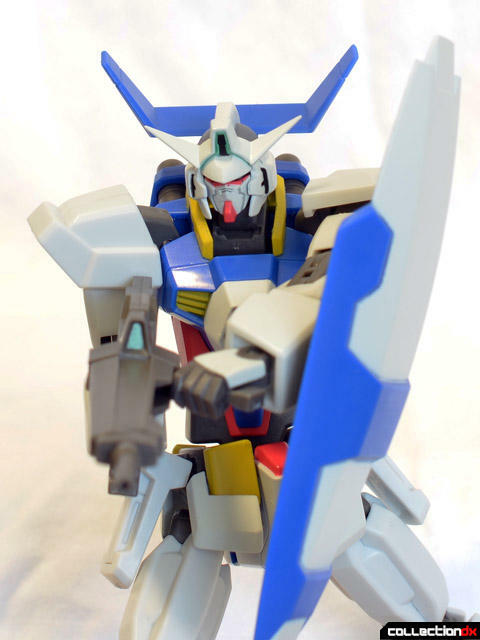 In AGE, Flit Asuno is the descendent of the Asuno family of Mobile Suit designers. When the mysterious Unknown Enemy attacks, Flit vows to destroy them, and designs the AGE System and his own Gundam to fight the UE. Flit thinks about Gundams a lot. 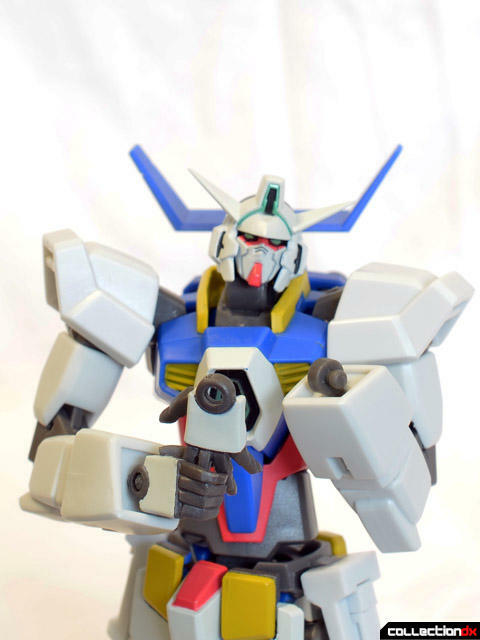 The Robot Spirits Gundam AGE-1 Normal stands five inches tall, and is made from hard, sharply molded PVC and POM. The figure separates at the waist for pants-swapping action with the other two AGE-1 variants, Titus and Spallow, sold separately. The AGE-1 Normal might be the most posable figure I have ever gotten. Everything moves, and the figure is sculpted for maximum mobility. It is a bit of an odd figure, with a slightly stretched out and gangly look to allow for such movement. 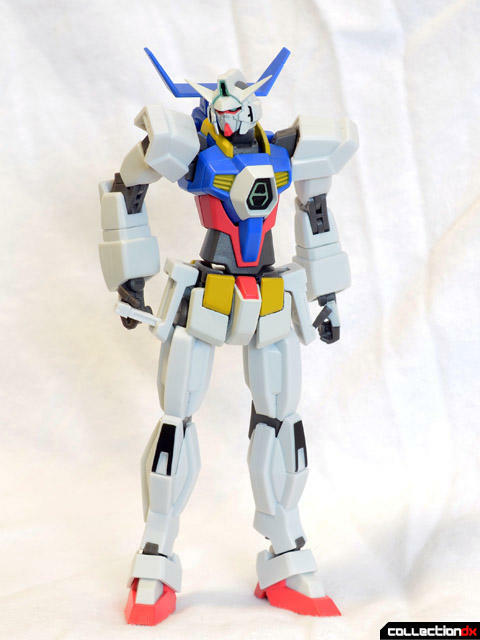 Many of the other Robot Spirits Gundam figures are very true to the line-art, or a bit chunkier, like the UC Zeon mobile suits, but this figure goes the other direction and is very slender and mobile. In action poses it looks great, but standing at ease, it can look weird in some angles. My two biggest complaints are the length of the torso, and the small feet, but neither is a deal breaker by any means. Compare with this shot of from the anime, where the AGE-1 Normal is drawn a bit chunkier. The legs have a cool feature that allows for extra movement at the knee. The knee armor and the back of the thigh move to allow for a tighter knee bend for extreme poses. …and side to side. 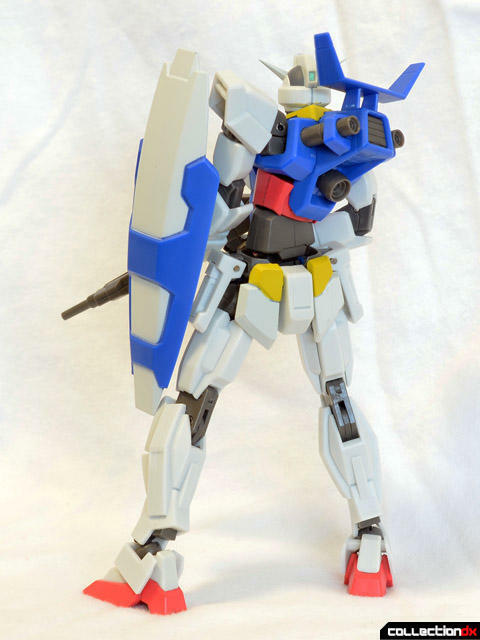 The torso is made of multiple overlapping parts, for a clean look regardless of pose. The hands are swappable, but they are a little different from most Robot Spirits figures. 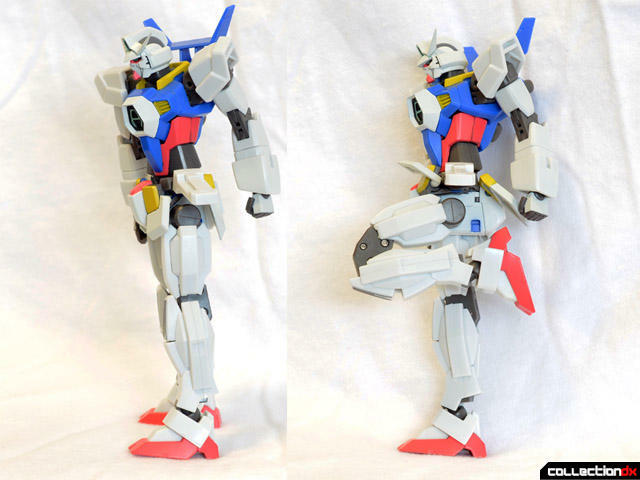 Instead of swapping via the ball joint, the AGE-1’s hands actually swap via the wrist swivel, which also makes for an additional point of wrist articulation. It is a little bit awkward to swap the hands this way because of the angular cuff around the wrists, but they fit securely and work great. 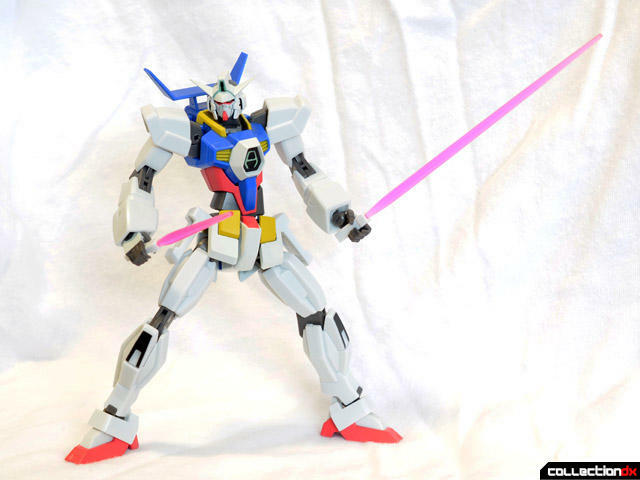 The AGE-1 Normal features removable beam saber hilts in its side skirt armor. They fit snugly so they do not fall out, and feature a groove on the sides for you to pull them out easily. 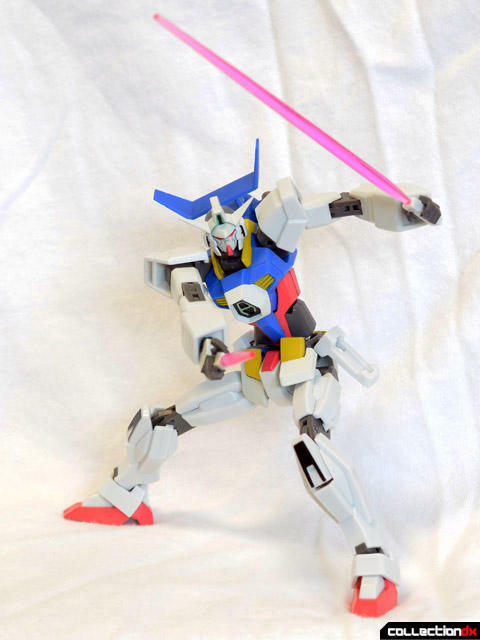 In the show, the beam sabers usually act like daggers with short blades, but long beam blades are also included. Even with just the swords, this figure is a blast to mess around with. Everything moves smoothly, and the whole package looks dynamic and fun. The DODS Rifle and shield fit into slots on the forearms, and are very secure. 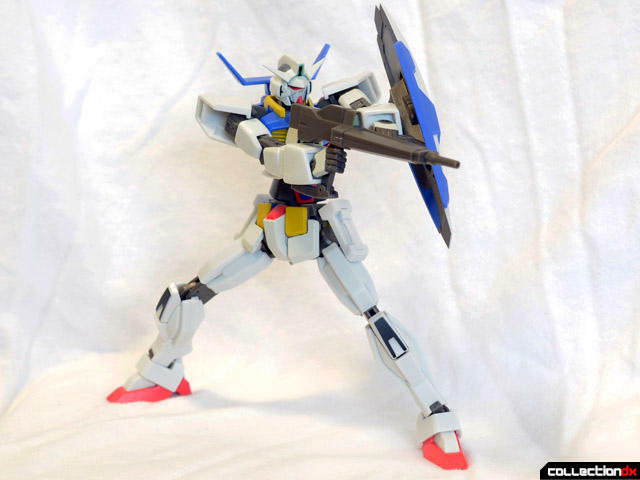 The shield can swivel, and the mounting arm for the rifle is hinged to allow for some movement. 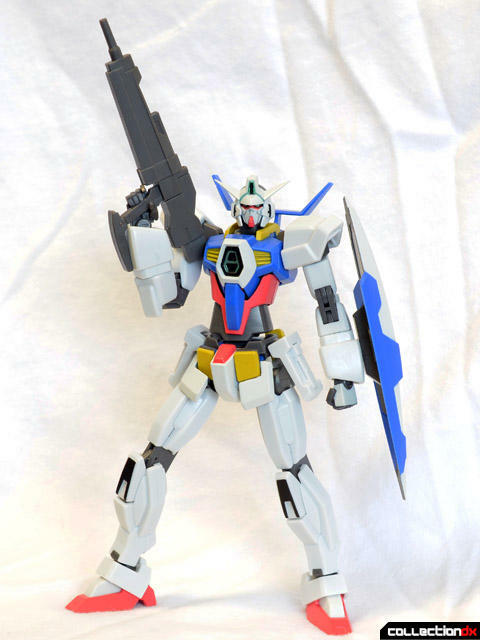 Fully armed, the AGE-1 Normal looks ready for action. Most of the action in the first arc of Gundam Age takes place in space, so one-handed badass rifle poses are the order of the day. 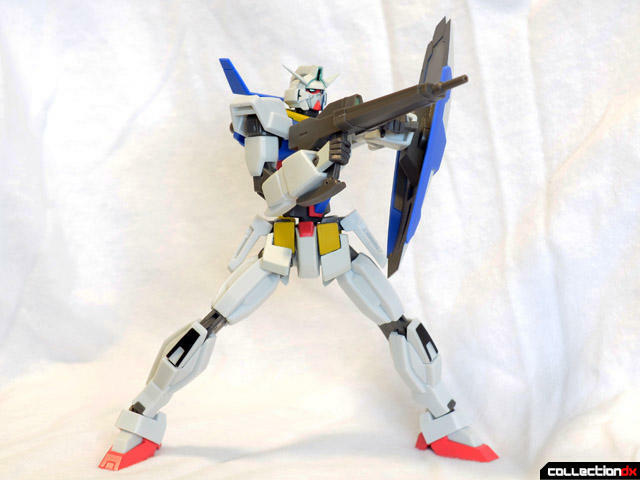 One minor thing I noticed is that, because of the mounting arm, the AGE-1 Normal cannot hold its rifle perfectly straight out. 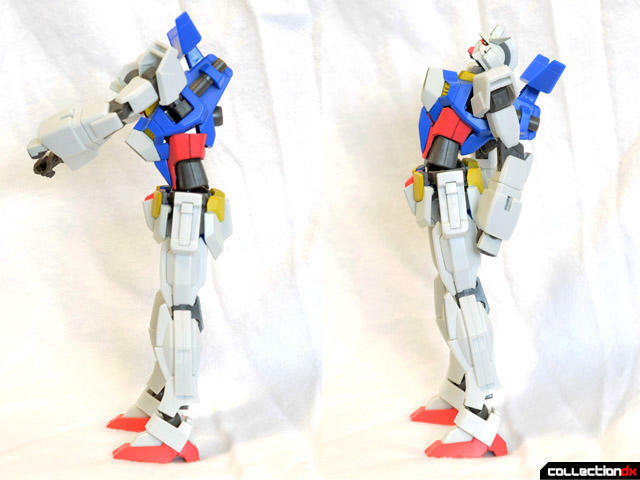 It always has a slight angle at the wrist, which is not a huge deal, but can throw off the look of some poses. The front of the rifle swivels and a grab handle folds out for two-handed gun poses. 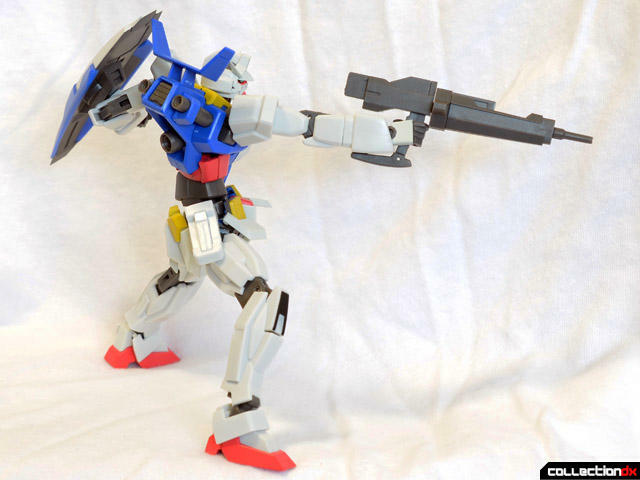 Because of the slightly lanky and elongated proportions of the figure, I found two-handed gun poses to be a bit awkward. It can be done, but I don’t think they are the figure’s strength. The booster effect part is molded in softer clear blue PVC and looks great. It is slightly flexible and wraps around the three engine nozzles on the backpack. 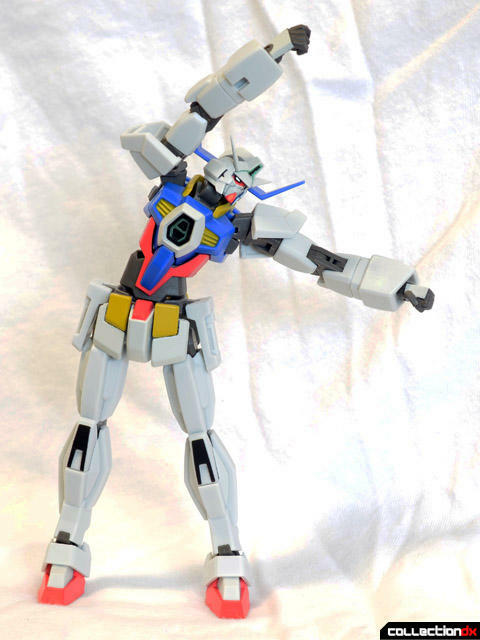 It is not too hard to knock it off by accident when posing, but it stays on pretty securely in general. The end closest to the body is slightly frosted, and the whole thing looks great. 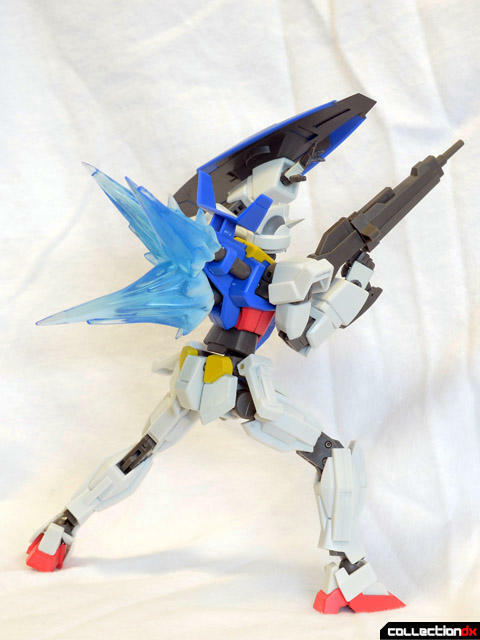 Gundam AGE-1 Normal can kneel thanks to its double-jointed front skirts. This figure looks great doing just about anything. It’s a bit gawky when compared to some other Robot Spirits figures, and other renditions of the design, but it’s also lithe and dynamic. 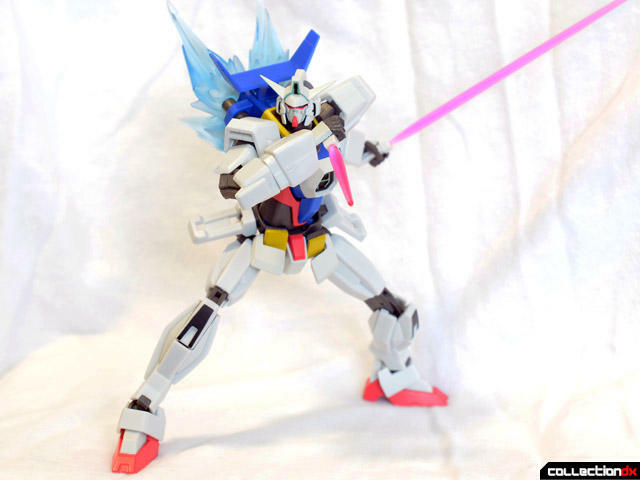 Most of the action in Gundam AGE happens very fast and very dramatically, so the stylization of the sculpt on this figure makes sense. It’s a simple, fun figure that feels great and looks good. 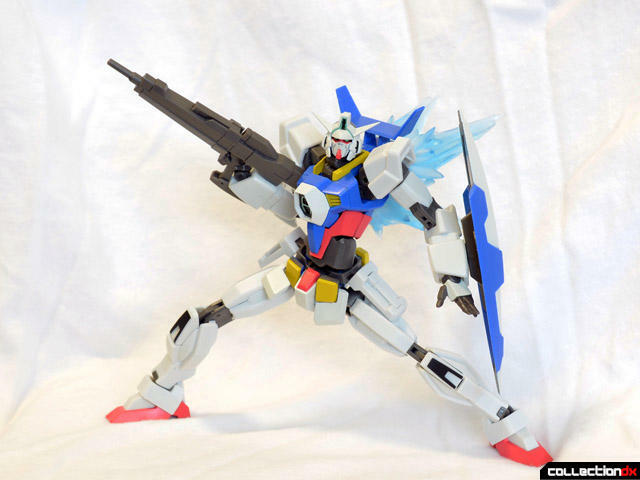 Get your Gundam AGE Robot Spirits at Angolz.com. On one hand I praise this toy for its Microman-like hyper poseability, but I share you doubts over the length of the torso, which for me is simply too much. 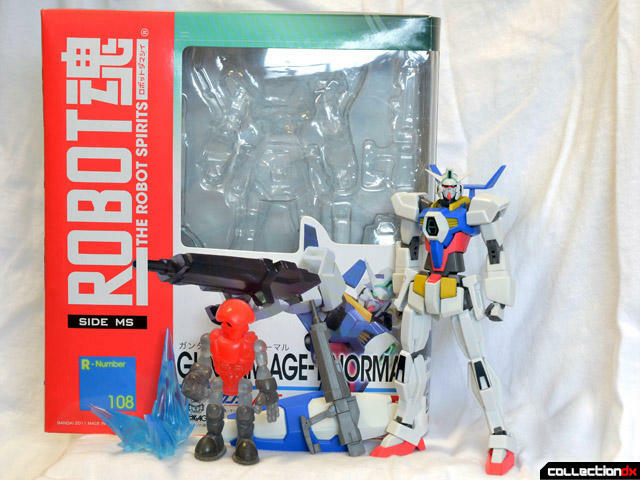 This toy would look really odd sitting next to High Grade AGE-1. 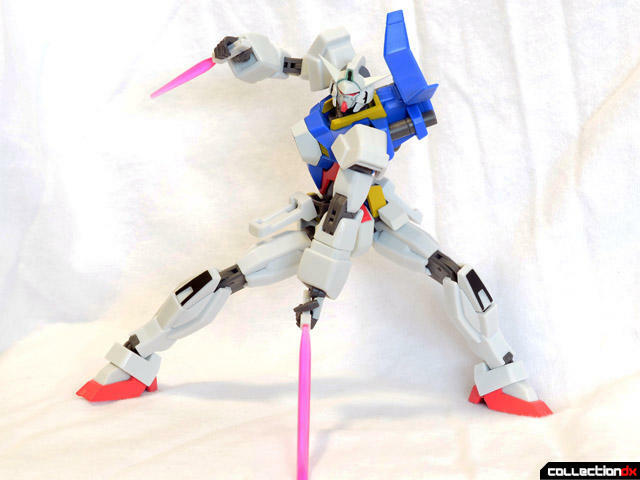 In my case this is a definite deal breaker and undoing of this toy, as I don't think I could stand looking at the torso with this guy next to my remaining three gundam mobile suits. 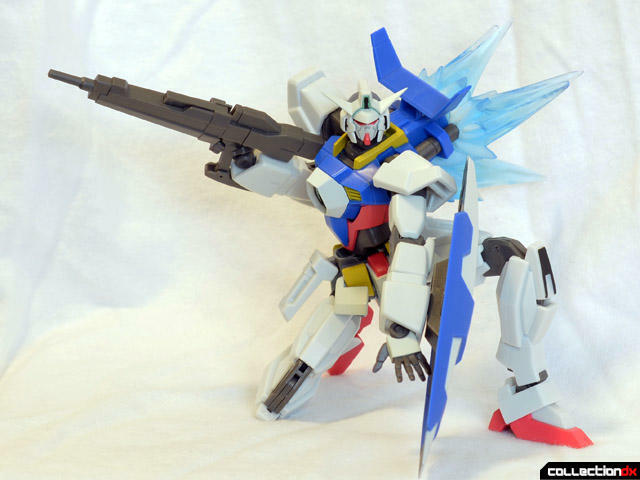 I was thinking about it, and I agree that they won't look right next to the HG kits, but I'm not sure if that actually matters. The other RS AGE-1 variants have similarly stylized sculpts, so at least the trio will look right together. I guess the issue will be if any more AGE Robot Spirits, they will all need to be similarly sculpted, or the line will look weird together. I think they will look good in their own bunch, but not all that much with other Robot Spirits mobile suits. 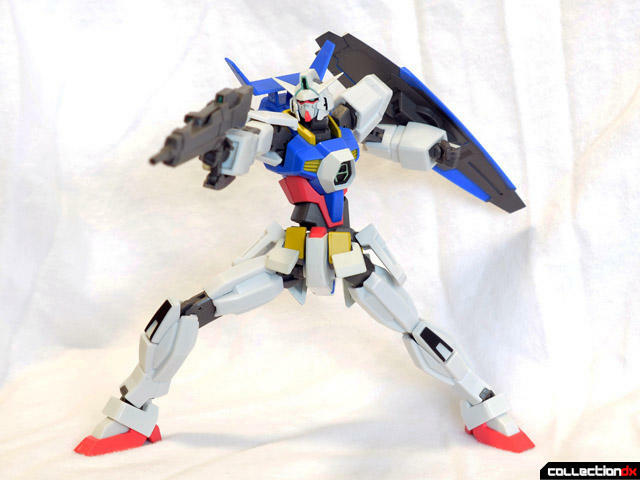 V-Gundams, Strike and Destiny and others seem to have more line art accurate proportions. I think only AGE-1 Sparrow looks good, thanks to his already thin aesthetics. Wow. It's got crazy amounts of articulation! Yeesh, that is WAY too lanky for my tastes. I think I'll wait for one of the grunt suits; I always end up liking them better. 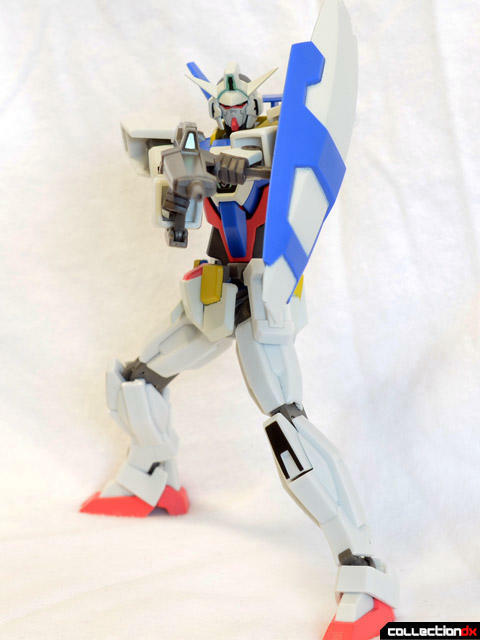 Besides, this just doesn't go far enough beyond the standard Gundam look for it to be worth it to me. Too many Gundams as it is! Still, impressive toy in and of itself. 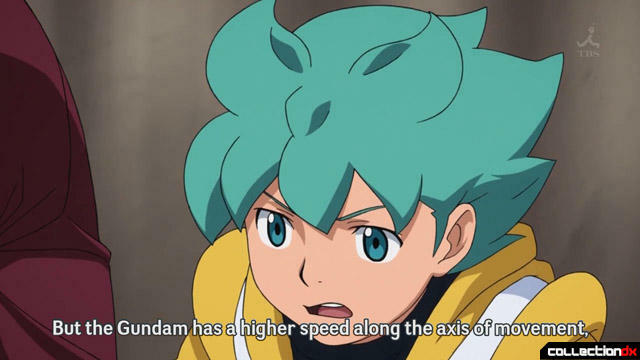 The reason this thing is lanky is that if one looks closely, during action in the show they will artificially stretch the proportions of the AGE 1 to make it appear more dynamic. It succeeds at recreating that look perfectly, so if you're looking for a super articulate version of that design it does fit the bill. Myself, I don't care for it. I always find it funny when people say that a figure such as this is not anime accurate. As stated before, in this series when Age is in action they drastically change the porpotions of the mech to increase dramatization (as done in a crap load of animes and cartoons actually). In-fact when they were first showing off promo shots of this fig they did so comparing it from shots directly from the show, thus showcasing how the figure could repoduce the exact pose as seen in the series. 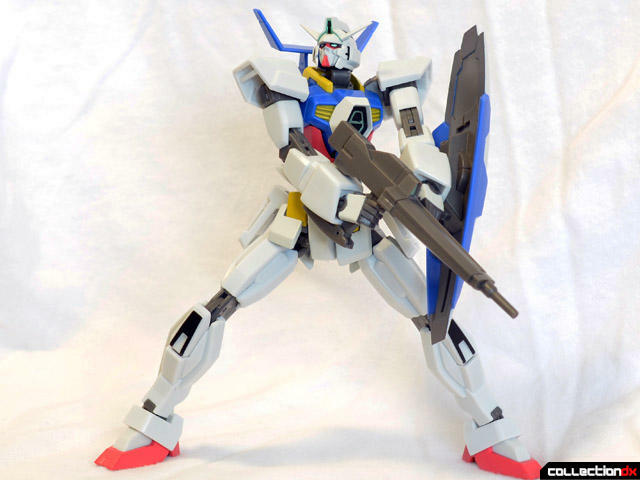 I do agree he does look a bit lanky and I would of perfed if bandai when the stretch route wher you would extend joints in order to do more stylized posing and when not doing such things you could revert it back to a more standard look.